As Japan’s business transactions with developing countries become more active, private sector-led economic development in these countries will greatly improve, and from this growth, Japan can benefit by vitalizing its innovations and small and medium-sized enterprises. Thus, the Japanese Government has been creating and expanding various policy measures, systems and schemes to support business transactions with developing countries that are implemented by public organizations such as Japan External Trade Organization (JETRO), JICA, JBIC and the Organization for Small & Medium Enterprises and Regional Innovation (SME Support, Japan/SMEs). While most of them are used is the developing countries in Asia, they gradually started to be used for business transactions with Africa. This section will invite government/public sector people to actively introduce these schemes and will provide information about the Africa-related business activities supported by these schemes. There are mainly 3 types of systems and schemes related to the African business support: 1) support for overseas expansion of enterprises, 2) support from the Ministry of Foreign Affairs of Japan and 3) the public-private schemes engaged in development aid. To facilitate the international trade between Japan and foreign countries and support overseas business of Japanese enterprises, JBIC provides financial services such as loans and investments, JOGMEC offers financial support for Japanese enterprises engaged in resources development in specific and NEXI gives trade insurances. To facilitate SMEs expanding its assistant in overseas markets, the Conference on Supporting SMEs in Overseas Business was established in October 2010 by bringing government officials and supporting institutions such as related government organizations, SME associations, financial institutions and the Minister of Economy, Trade and Industry serving as the chair. Minister of Economy, Trade and Industry also developed “The Framework for Supporting SMEs in Overseas Business” (in Japanese) in 2011. Please contact Trade Policy Bureau Middle Eastern and African department for inquiry regarding support for African business. Information about policy measures, systems, and schemes for supporting SMEs in overseas business is summarized in a website of Small and Medium Enterprise Agency, “Supporting SMEs in Overseas Business” (in Japanese). 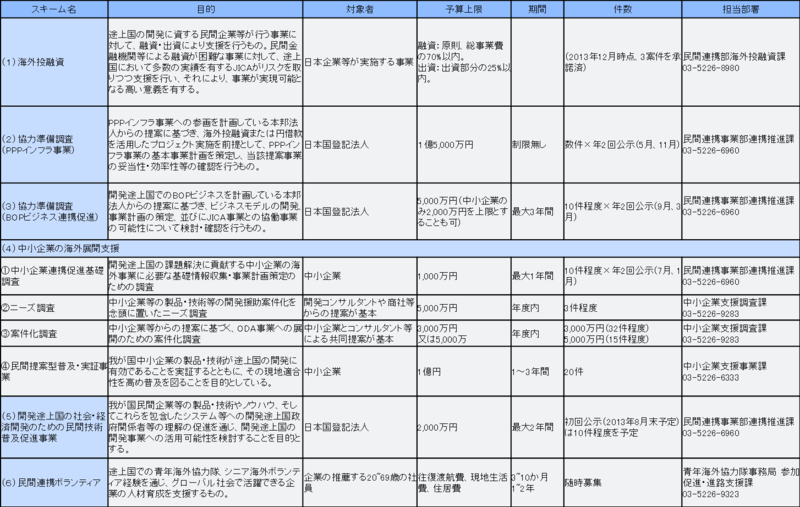 “Measures for Supporting SMEs in Overseas Business” (in Japanese) is published on the website. The document contains information about public agencies supporting international business by giving 1) Overseas information collection, 2) Advices for overseas expansion of business, 3) Investigation and planning for commercialization, 4) Human resources development and recruiting of global and local subsidiary companies, 5) Development of markets, 6) Product development and test marketing, 7) Fund-raising, 8) Risk management, 9) Intellectual property right and legal issue management and 10) Support before and after overseas expansion. Some of these supports, despite they cover each area of overseas, might have not applied in Africa before. Also, some of these supports are not limited to SMEs. In Africa, all diplomatic establishments abroad have “Business support service desk for Japanese enterprises (in Japanese). Resident officers in charge are proactively giving advices and responding for support request. In addition, the International Cooperation Bureau of the Ministry of Foreign Affairs of Japan has ODA Task Force for Supporting SMEs. Africa is the key area in development assistance. The development projects are implemented based on the assumption of active participation of private enterprises, and also the provision of business opportunities to them. In particular, active use of SMEs and our excellent technologies is encouraged in ODA implementation. Furthermore, there are wide varieties of schemes to encourage Japanese enterprise to actively put efforts in the BOP business that can contribute to the poverty reduction of developing countries. To support overseas business and international trade of Japanese enterprises, JBIC provide financial services such as loans and investments. We also provide information about foreign affairs and investment conditions and offer advices about way of raising long-term funds to small and medium-sized enterprises. JOGMEC provide loans and make joint investments for Japanese enterprises engaged in resources/energy prospecting/developments. NEXI trade insurances covers uncontrollable risks/deficits that arise from foreign transactions such as export and import, overseas loan and foreign investment. Risks/deficits which the counterpart in foreign countries is responsible are also covered.